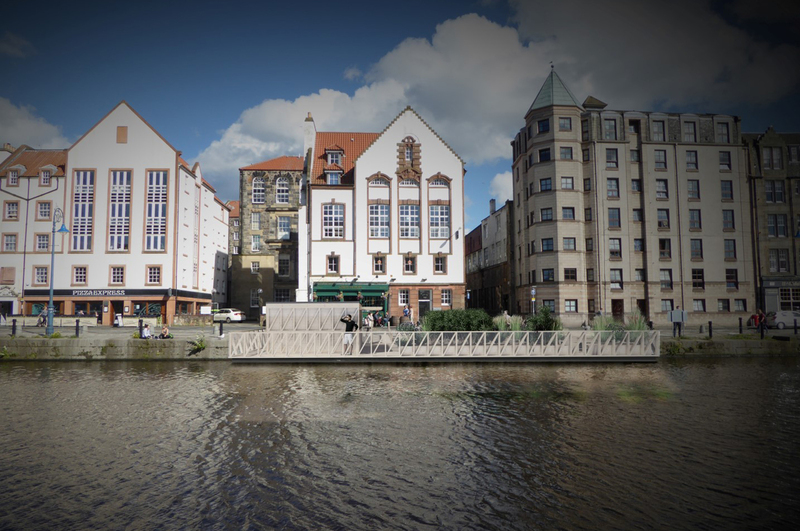 GRAS have recently submitted a planning application for River Craft: a new floating platform that is as an expansion to the Malt & Hops pub on the Shore, Leith, Edinburgh. 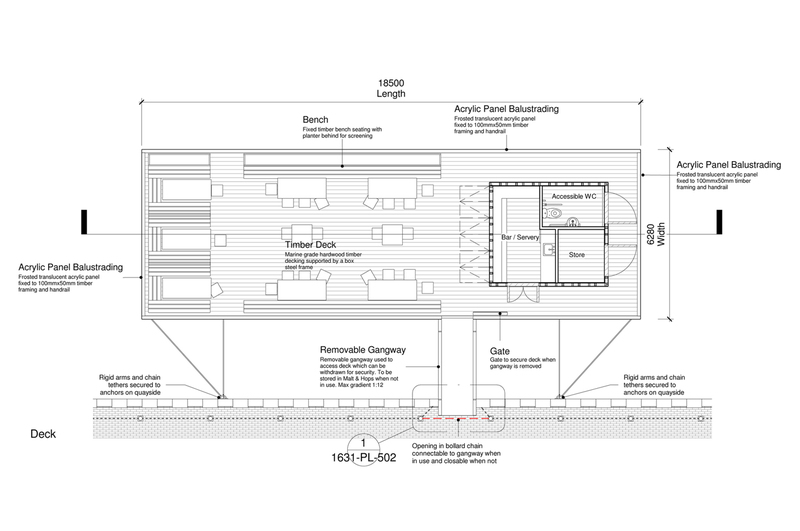 The proposal is for the installation of a new floating deck (18.5 m x 6.3 m) to the eastern edge of the Water of Leith basin, directly opposite the pub, which can accommodate additional seating, a servery, storage space and an accessible WC. 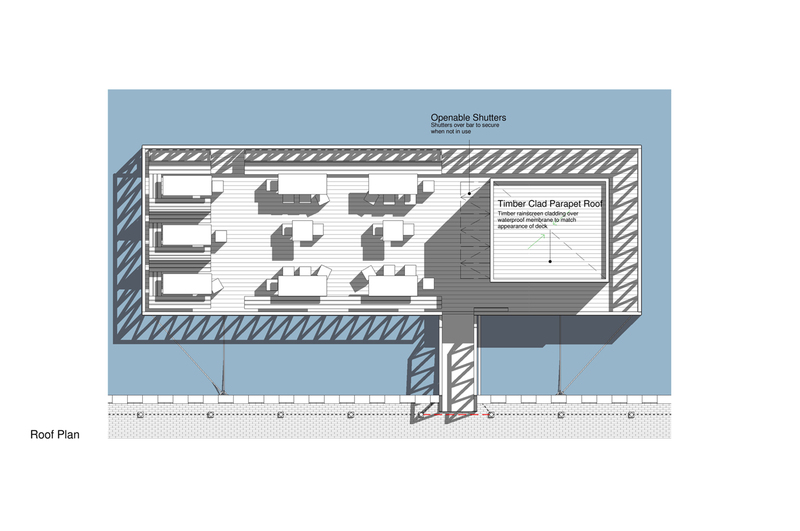 The expansion will also benefit from additional sunlight for a longer period of the day. Its distinct aesthetic will provide enhanced marketing opportunities to help improve the long term sustainability of the establishment while adding to the creative capital of the area. The servery will specialise in the provision of locally sourced beverages, including craft ales, and in the cooler months will be used as a test brewery. 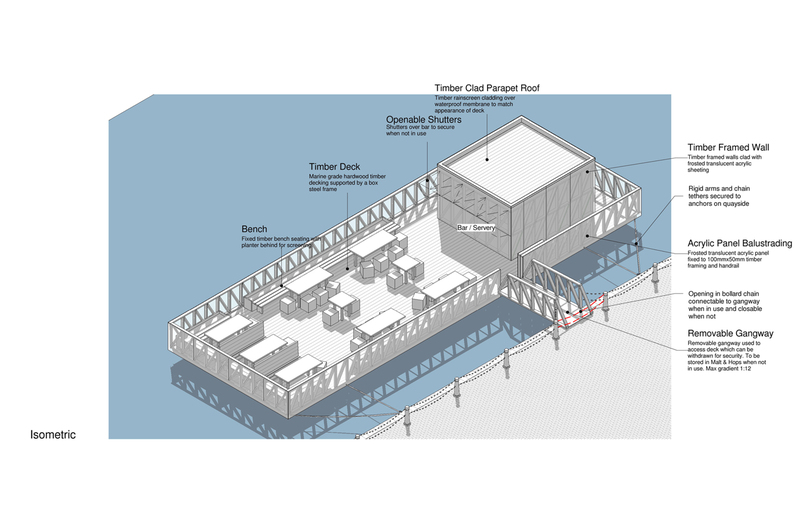 It is hoped that in time the deck will act as a catalyst to develop the production of craft ales, cordials and tonics as part of the Shore Brewery project which is currently being developed locally. 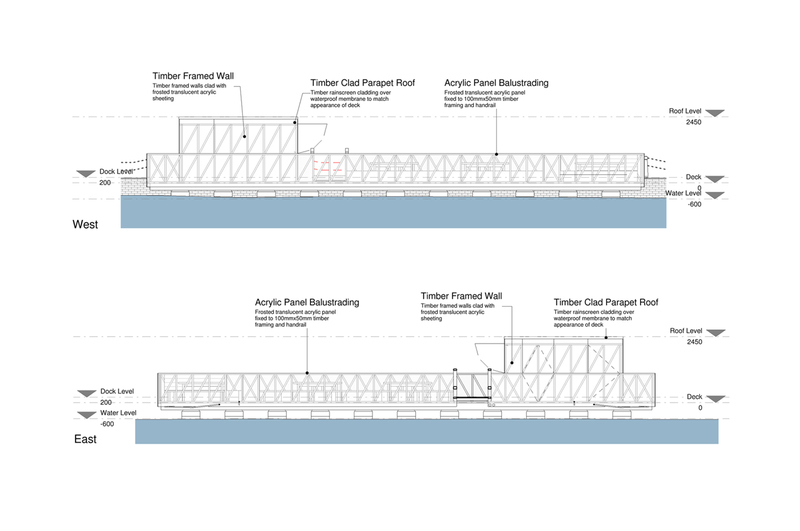 The timber clad deck will be supported on a box iron frame, encasing ballasted floats. Around the perimeter will be fixed a timber-framed balustrade clad in flush-finished translucent acrylic. This will provide some shelter from low level breeze while maintaining views to the surrounding basin and associated wildlife and ecological habitat. 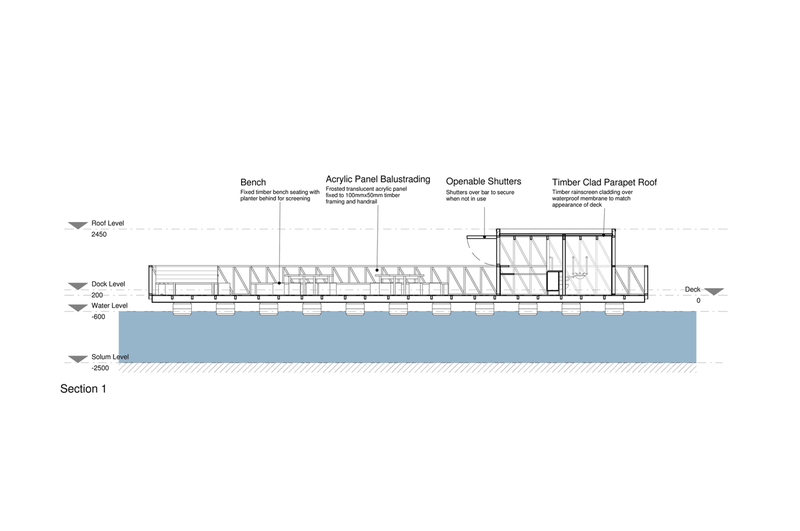 The aesthetics of the timber-framed balustrade will continue around the platform to form the servery, store and accessible WC on the north side. 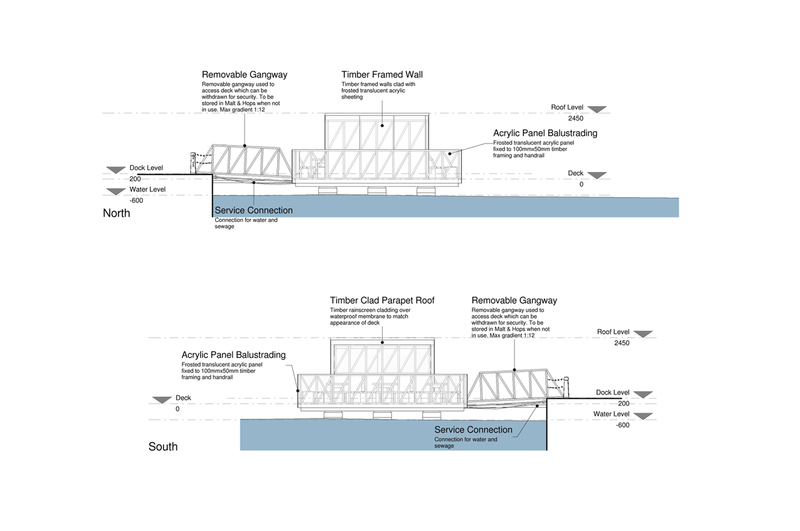 The structure will be moored against the dock with fixed arms which are capable of moving up and down with the slight changes in water level. 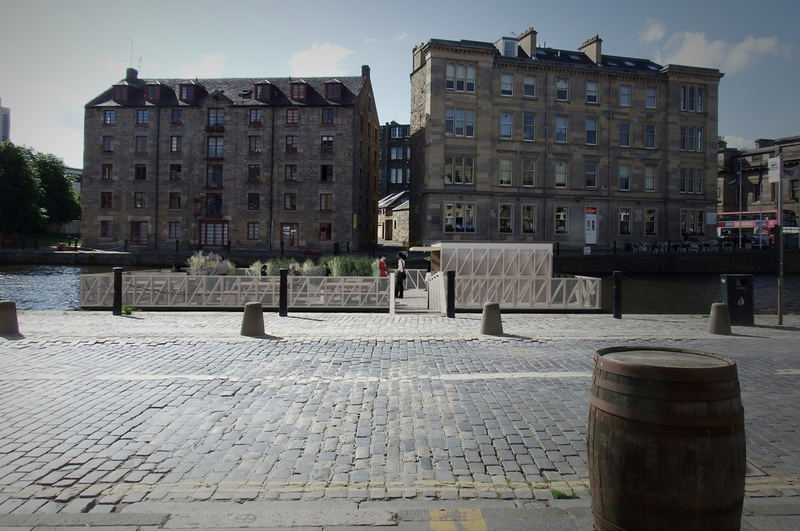 Although the design is not specifically nautical, the overall form is inspired by local barges and Leith’s history as a port. The finishes throughout have been kept intentionally restrained, using only simple forms and modern architectural detailing. As such the proposal is respectful of the character and architecture of the surrounding area and is designed to be striking but not dominant. River Craft has been designed locally and will be built by local craftsmen. The aspiration is that it will contribute positively to the community, further enhancing the vibrancy and diversity of the area while developing a local business to meet growing demand.